Thanks to our generous donors, Active Trans is able to carry out our important work throughout the Chicago region. Everyone who travels around Chicago recognizes Ashland Avenue as one of the most important transportation corridors in the city and can see it’s long overdue for an upgrade. No matter what mode of transportation you’re using, trips are often frustratingly slow and unpredictable, especially during the morning and evening rush. Installing center-running dedicated bus lanes and granting buses traffic signal priority, as the city first proposed in 2013, would speed up many of those trips and offer fast, consistent transit service to more than 10 million riders every year. That’s why the Ashland Bus Rapid Transit (BRT) project is one of 10 potential rapid transit expansion projects featured in our Transit Future vision. If you live near Ashland, click here to tell the Cook County Board you support Transit Future and expansion projects like Ashland BRT. Currently, the Chicago Transit Authority (CTA) is reviewing feedback from the 2013 public outreach process and considering changes to the design before pursuing additional funding. A county revenue stream for transit like we call for in Transit Future would provide the local match needed to access millions of dollars in available federal funding for projects like Ashland. 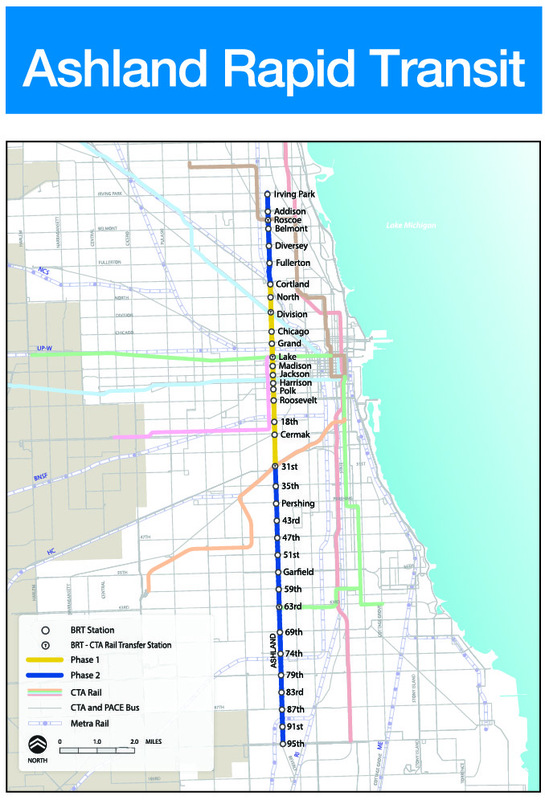 As explained in our Sun-Times op-ed back in March, Ashland BRT would be the city’s first rapid transit line that doesn’t feed downtown, instead connecting West Side communities along the CTA’s Orange, Blue, Brown and Green lines. Moving beyond the hub-and-spoke model of our current rapid transit system is one of the biggest reasons our Transit Future vision has gained traction. We’re currently meeting with residents and community organizations all along the first phase of the project (31st Street north to Cortland) to collect public feedback as we urge the city to take the next steps in the public process. Some residents have raised legitimate concerns about the design, such as the impact of eliminating many left-hand turns, and we’re hopeful the city will re-engage the public on these issues and make any necessary adjustments. Once it’s complete, Ashland BRT will connect 12 communities between 95th Street on the south end and Irving Park Road on the north end. More than 232,000 Chicagoans live within a half-mile of Ashland, and one in four of those households do not own a car. Nearly 100 schools, and countless small businesses, restaurants and hospitals, are within walking distance of Ashland. The #9 Ashland bus is the most popular route in the city, with 10 million boardings annually. The corridor connects to 37 bus routes, seven CTA rail stations and two Metra stations. If you’re on board and live near Ashland, sign a letter to the county board today in support of Ashland BRT and transit expansion projects like it throughout Cook County. Check out the Ashland page on the Transit Future website for more details about the benefits of the project. This is the first post in our “10 lines, 5 weeks” blog series. Each week from now until Labor Day, we’ll take a look at two lines in the Transit Future vision and make the case for why the county board should take action to expand the rapid transit network in Cook County.